You see them everywhere but have you ever tried to make a mason jar salad? It's surprisingly gratifying and convenient (especially for those of us who pack our lunch for work). Check out the article below on how to throw one together and let us know what you think! 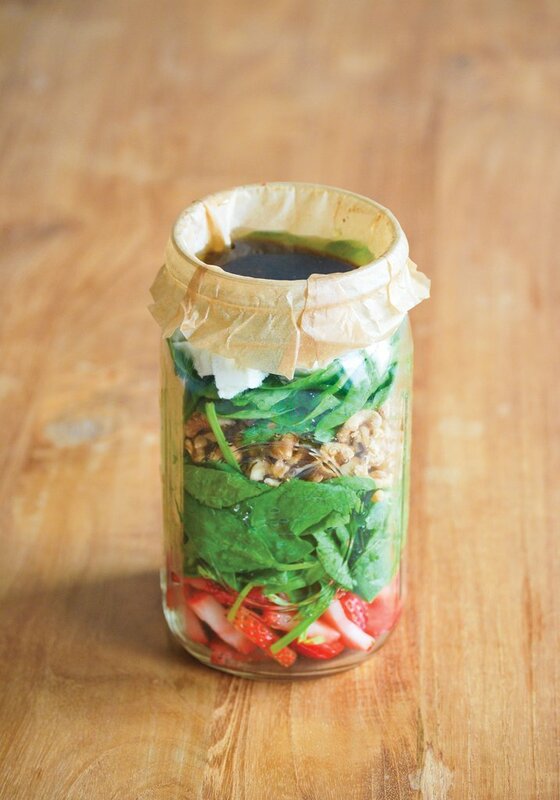 Packing a to-go salad in a mason jar seems like a great idea — it's an easy way to transport a vibrant, veggie-heavy meal without worries of dressing leaking into your bag — but if improperly assembled, it may end up underdressed, soggy, or less than fresh. Don't let that happen to you! Instead, follow this step-by-step guide, excerpted from Julia Mirabella's Mason Jar Salads and More: 50 Layered Lunches to Grab and Go ($12, originally $17). Next add some salad ingredients that won’t soak up the dressing, such as carrots, cherry tomatoes, sugar snap peas, or chickpeas. Continue to layer your salad with your chosen ingredients. Pack the layers as tightly as possible — the less air between layers, the longer your salad will stay fresh. Finally, layer on your salad greens. By ending with the greens at the top, you’ll create a moisture barrier that prevents the entire salad from becoming soggy. If you are including cheese and/or nuts, add them last. 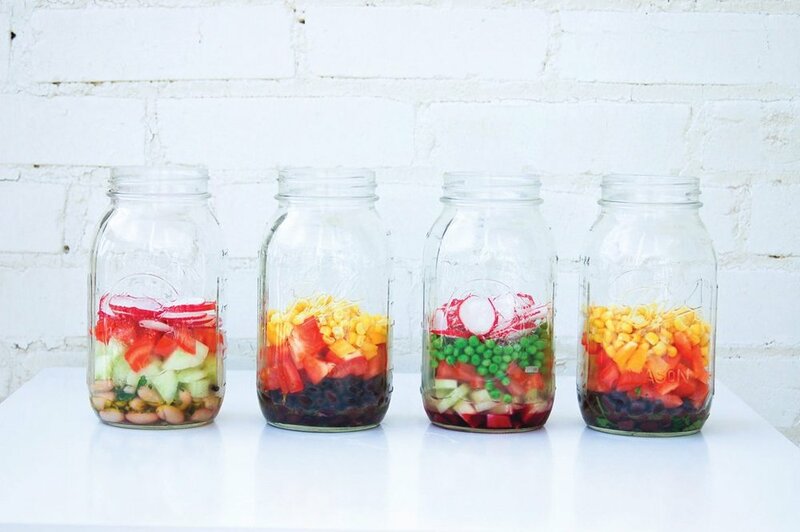 Twist on the tops to seal your salads, place the jars in your refrigerator, and you’re good to go! If you want to include a protein such as chicken, just place it on top of the salad greens in the morning on the day you’ll eat the salad. When you’re ready to eat the salad, just pour it into a bowl and toss to mix the dressing into the salad. 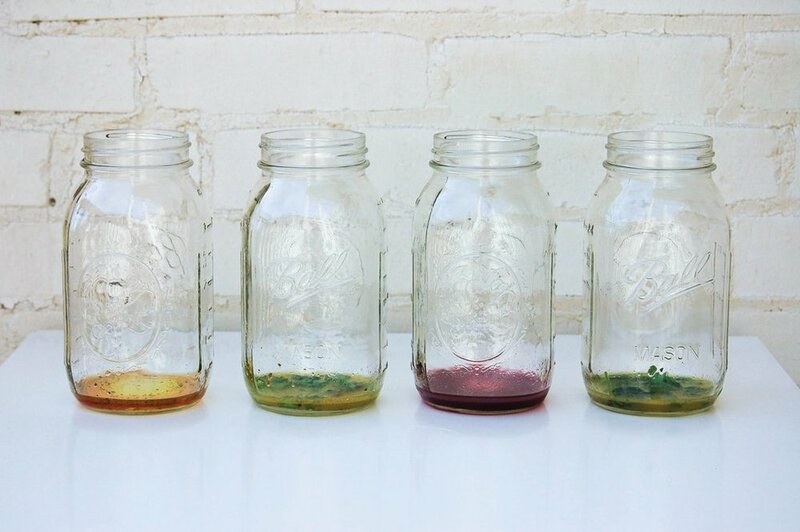 Some of the best salads don’t include any firm vegetables, and this can be problematic when it comes to layering your salad dressing at the bottom of the jar. Fruits, for example, will soak up the vinegar in dressing. At least one company sells reusable cups that fit into the tops of mason jars, providing one solution. But for a quick and inexpensive fix, all you need is parchment paper, or even plastic wrap. To use the parchment paper fix, layer your salad in the jar as usual but leave out the dressing. Instead of filling the jar all the way up, leave some space for dressing at the top. Cut out a square of parchment paper that’s about a couple of inches wider than the jar top on all sides (an 8 x 8-inch square is more than enough). Place it over the jar and push down to form a little cup. The edges of the parchment paper should extend beyond the edge of the jar; bend them down toward the outside of the jar. When it’s time to eat, just dump the dressing into your bowl, empty the contents of the jar into the bowl, and toss your salad.